BigDL is a distributed deep learning library from Intel released and open-sourced in 2016. Besides offering most of the popular neural net topologies out of the box, BigDL boasts of extremely high performance through its usage of Intel MKL library for numerical computation. BigDL supports import/export of networks pre-trained in TensorFlow, Caffe or Torch and there are plans to include interoperability with other libraries in the market. However, the most important feature that made us look into BigDL is its native integration with Apache Spark that enables users to leverage the distributed processing capabilities of Spark infrastructure for training and model serving. For enterprises already using Spark, BigDL works just like any other Spark library that supplements the machine learning capabilities offered by Spark ML. Lightbend Fast Data Platform (FDP) uses Mesosphere DC/OS as the cluster manager. FDP aims to make it easier for customers to productize the use of BigDL through its offering by integrating Spark as part of the platform. Machine learning applications developed using BigDL and Spark can also take advantage of the best-in-class streaming engines, the Lightbend Reactive Platform and messaging technologies like Kafka that form the complete suite of FDP. In this blogpost, Lightbend’s Fast Data Platform team and Intel’s BigDL team collaborate to describe the experience of implementing and deploying deep learning models on BigDL using Spark on Mesosphere DC/OS. DC/OS architecture provides a layer of abstractions of the core cloud infrastructure or the “bare-metal”. The platform layer offers the core datacenter operating system support along with container and cluster management services. The software layer provides installation, configuration and management of services like databases (e.g. Cassandra), message queues (e.g. Kafka), distributed processors (e.g. Spark and Flink), notebooks (e.g. Zeppelin) and many others. Users can also install their own services and have scheduling, configuration and management done by DC/OS. Given the capabilities of Mesos and DC/OS, it’s no surprise that deploying Spark applications on it enjoys some intrinsic advantages with respect to manageability and scalability. DC/OS adds operational simplicity on top of Mesos kernel, which makes managing distributed platforms like Spark and Apache Flink much easier from the operational point of view. You get isolation amongst the various versions of your Spark applications, yet enjoying the benefits of the complete shared infrastructure that DC/OS offers. In summary, there are a lot of potential advantages to running distributed Spark-based applications on your Mesos DC/OS platform. BigDL is a deep learning library for Spark and hence running BigDL-based applications on DC/OS gives you all the advantages that you get with native Spark applications. BigDL offers rich support for deep learning, can load/save models from frameworks like TensorFlow, Torch and Theano and is high performant via its usage of Intel MKL and multi-threaded programming in each Spark task. DC/OS complements these advantages with easier manageability and optimization of resources through a truly shared infrastructure. Just like any other Spark application, you can specify up-front your application’s potential resource usage and thereby achieve optimization of total cluster resources. The diagram shows the core Spark service running with a resource usage of 1 CPU and 1GB memory. Now when you deploy Spark / BigDL applications, they will show up as additional drivers in the UI. As an example, the above screenshot shows an additional Spark driver running with 1 CPU and 8GB of memory. The deployment of the BigDL application to a DC/OS cluster is as simple as executing the following command, where $SPARK_APP_JAR_URL refers to the location from which the application jar can be fetched for loading. Note how the left panel also shows the other details of the cluster and the overall resource usage by all applications deployed on the cluster. You can navigate through the Sandbox link corresponding to the task and browse through the various log files that your application generates. One of the big advantages of running applications in a Spark cluster is the ability of Spark to dynamically add and remove resources from your application. This is done by Spark’s dynamic resource allocation and a BigDL’s deep learning application can enjoy these advantages as well. In addition, you can use Mesos as the cluster manager that integrates seamlessly with Spark’s dynamic resource allocation. Thus, running multiple BigDL applications on a Mesos cluster offers you cluster optimization as well the ability to resize the number of Spark executors based on the statistics of your application. For more details, please have a look at this document on running Spark on Mesos. BigDL offers a user-friendly, idiomatic Scala and Python 2.7/3.5 API for training and testing machine learning models. As an example, here’s a snippet that prepares a dataset for training in a VGG network passing it through a pre-processing pipeline. The pipeline API makes it explicit that it starts with the raw bytes, then goes through the stage that converts raw bytes to BGR image, then the normalization of the image and finally the batch-based processing. This makes the APIs self-descriptive and the resulting code much more readable without losing an iota of type-safety guaranteed by Scala’s type system. Finally, when you have all datasets prepared, you can define the Optimizer that will train your model using optimization algorithms. The idiomatic Scala API for training and testing machine learning models proved to be a big plus for BigDL. The latest versions of BigDL offer integration with TensorBoard, a big step towards enabling the visualization of the learning process of your machine learning classifier. The BigDL Optimizer can be configured to generate summary information during training and validation steps that can be consumed and displayed by TensorBoard. 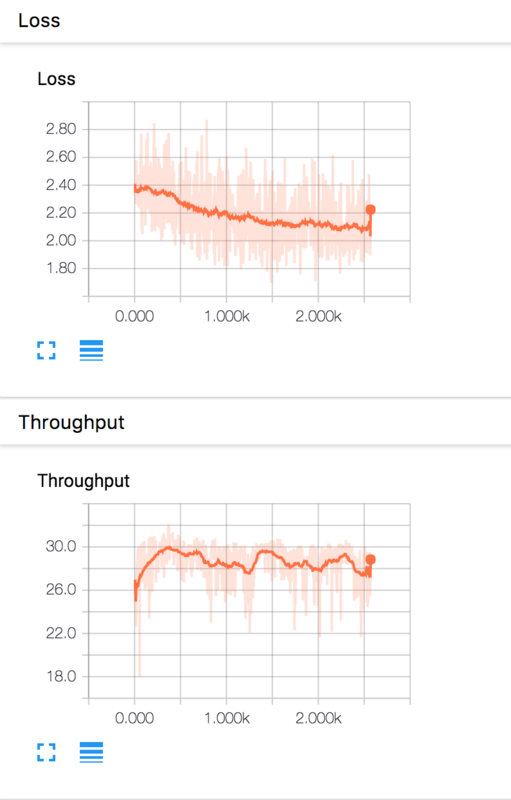 Here is an example snapshot that displays the Loss and Throughput during the training of one of our classifiers. This blogpost gives an overview of how you can use BigDL on Spark as a platform for machine learning within the Mesos DC/OS cluster manager. BigDL gives you the ability to implement complex neural net topologies for deep learning, while Mesos and DC/OS give you the power to run multiple applications within the confines of an optimally managed cluster. Lightbend Fast Data Platform makes it easy to use BigDL on Spark along with the other streaming engines, messaging technologies and the reactive platform that it offers. VGG network is a variant of convolutional neural network developed by the Visual Geometry Group of Oxford.